You won’t believe how many activities there are to enjoy in this playground set. 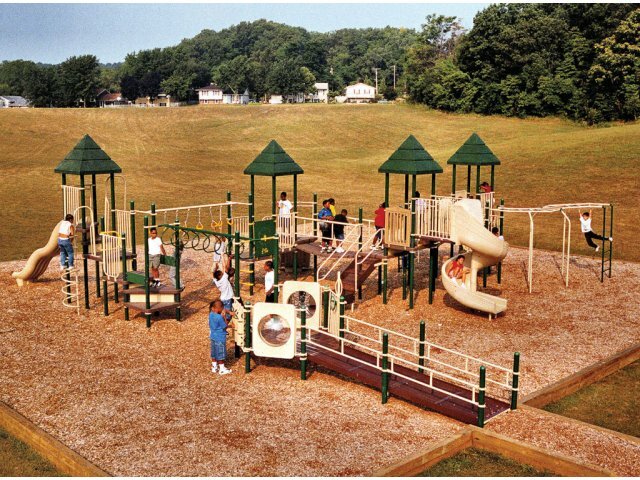 A brilliant design provides something for everyone so all children can have tons of fun at breaks and recess. The large structure is perfect for an elementary school that has many students on the playground at the same time. With four slides, three overhead events, two bridges, five climbers and panels galore children can stay busy for hours as they challenge themselves to try new things and develop critical motor skills. This playground is designed to encourage safe play for all children. A wheelchair ramp and an ADA transfer module facilitate an inclusive play environment. With four covered, fade-resistant platforms, your young explorers can stay cool on sunny days. Give your students the gift of unlimited educational fun with a wonderful playground from Kidstuff Playsystems. Kidstuff Playsystems designs and manufactures a virtual fantasyland of quality playground equipment. Their creativity, ingenuity and made-in-the-USA quality have been delighting children and educators across the country for over 20 years. Shady Play: A roof over the top platform keeps kids cool, even when it’s sunny out. Durable Construction: The rust-proof, fade-resistant, rotation-molded platforms feature one-piece construction. 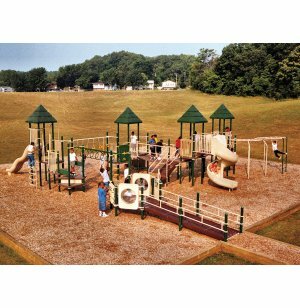 Strong Build: Playground components are supported by steel posts and connected by stainless steel hardware and self-locking nuts. Super Tough: Tested at over 8,000 pounds. ADA Accessible: A wheelchair ramp and ADA transfer module ensure that all children can get in on the fun. Meets all ADA guidelines. Safe Choice: Meets all government safety guidelines. No sharp or rough edges.